Engine Pro Sprints On Dirt presented by ARP returns to the most unique venue it has ever raced at. Michigan’s renowned Berlin Raceway, a leader among paved short tracks, is being transformed into a dirt track for a few, select races this fall. 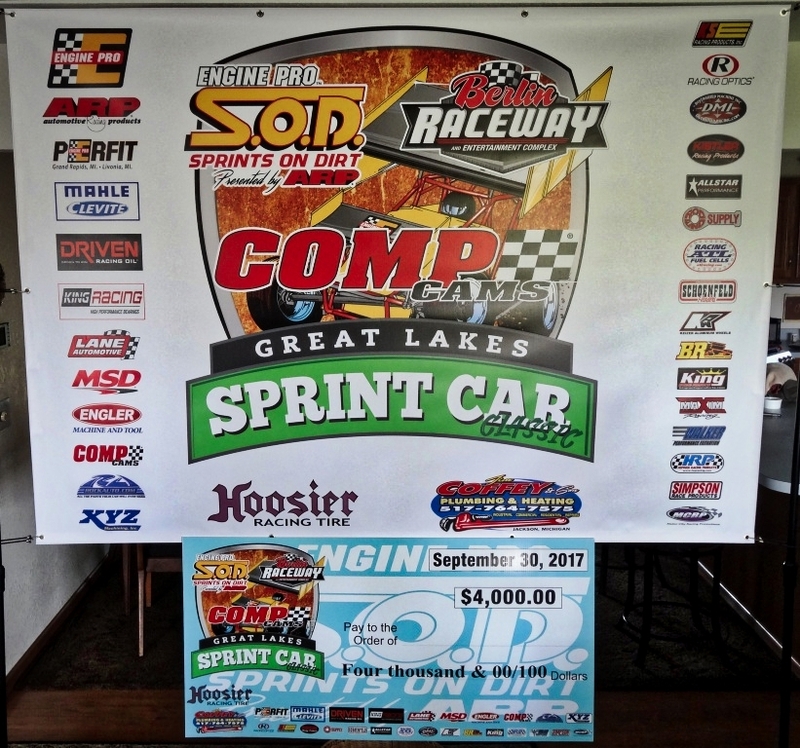 Saturday, September 30, the raceway will present SOD’s COMP Cams Great Lakes Sprint Car Classic. 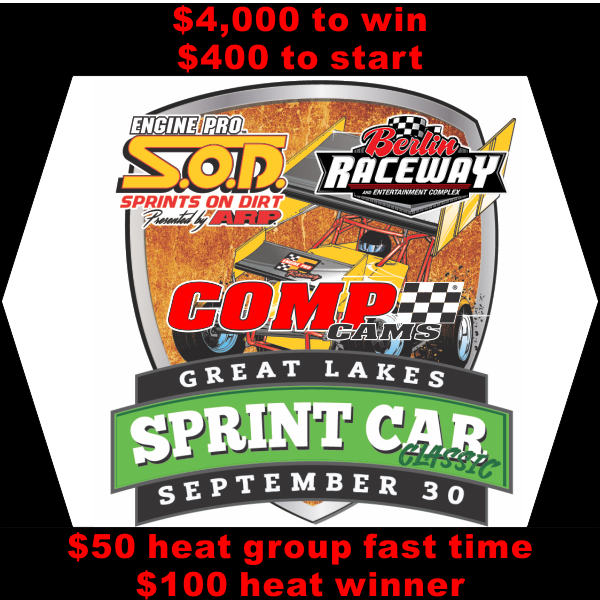 COMP Cams, a 2017 SOD heat race sponsor partner, has signed on as title sponsor of the Great Lakes Sprint Car Classic. The thirty lap feature will pay $4,000 to win and $400 to start. As with all SOD shows, Engler Machine & Tool, COMP Cams, RockAuto.com, Jim Coffey & Son Plumbing & Heating, and Engine Pro will pay $100 to each heat race winner. Lane Automotive and MSD Ignition will pay $50 to the fast qualifier in each heat group. $1,500 in contingency cash and awards will be available to competitors. Berlin Raceway’s storied 67-year history and SOD’s status as the nation’s most progressive and recognized regional sprint car series promise to make the race an event fans won’t want to miss. The Classic will be part of an event that includes Michigan’s three leading dirt series, Sprints On Dirt, the American Ethanol Late Model Tour (AELMT), and the American Ethanol Modified Tour (AEMODT). When it comes to oval track racing in Michigan, Berlin Raceway’s story is right at the top. In 1951, it was born as an oval dirt track located within the Berlin Fairgrounds. 1966 saw the track paved as a 7/16 mile asphalt oval track. In 2012, Berlin Raceway returned to its roots, covering the asphalt with clay and turning the track into a dirt track for the month of September. In 2013, 2014, and 2015, Berlin Raceway again hosted September dirt track racing. This will be SOD’s third race at Berlin with previous appearances in 2013 and 2014. Fuel will be for sale at the track by the drum or by the gallon. To order your drum(s) in advance, call Elite Fuels & Lubricants at 269-281-4100. Engine Pro Sprints On Dirt presented by ARP is brought to you in 2017 by many important sponsor partners including: Engine Pro (Title Sponsor), ARP (Title Sponsor), Hoosier Racing Tire (Official SOD Tire), MAHLE/Clevite (Beyond Limits Challenge Sponsor), Driven Racing Oil (Battlegrounds Bash Sponsor), King Engine Bearings (King of Michigan Sponsor), Lane Automotive/MSD Ignition (Fast Masters Sponsor), Engler Machine & Tool (Heat Race Sponsor), COMP Cams (Heat Race Sponsor), RockAuto.com (Heat Race Sponsor), The Perfit Corporation (Lucky Dog Sponsor), KSE Racing Products (Hard Charger Sponsor), XYZ Machining (Season Sportsman & Crew Chief Sponsor). In addition, SOD contingency sponsors include: Allstar Performance, ATL Racing Fuel Cells, BR Motorsports, Diversified Machine Inc. (DMI), K2W Precision/Keizer Aluminum Wheels, King Racing Products, Kistler Racing Products, Maxim Racing, Motor City Racing Promotions, Racing Optics, Rod End Supply, Schoenfeld Headers, Simpson Racing Products, Walker Performance Filtration. With the final points race in the books, Steve Irwin (Fenton, MI) has earned the 2017 Engine Pro Sprints On Dirt presented by ARP championship. The Flying Zero team of Irwin, car owner/wife Adrianna, and crew chief Nathan Whitney put together a consistent season in their Krieger-powered Maxim Flying Zero, finishing in the top seven in fourteen races while dropping out of one. Irwin isn’t unfamiliar with championships. This is his second SOD championship, having won the first in 2001. He also won the 2007, 2009, 2010, and 2014 non-wing, dirt Michigan Traditional Sprints championships and the 2014 Spartan Speedway non-wing pavement championship. Irwin has 49 feature wins. Besides the season championship, Irwin also won the SOD MAHLE/Clevite Beyond Limits Challenge four-race championship. He finished second in the King Engine Bearings Hartford Speedway King of Michigan four-race series and fifth in the Driven Racing Oil Butler Speedway Battlegrounds Bash four-race series. 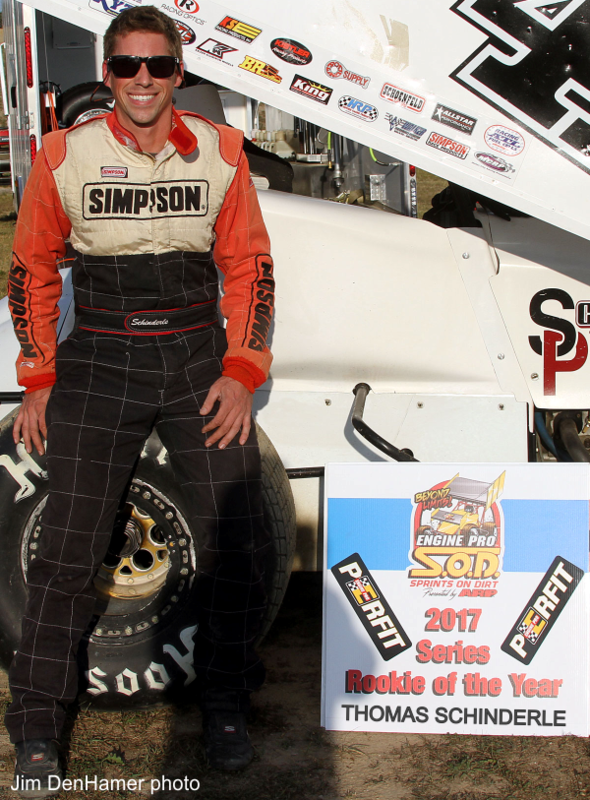 Thomas Schinderle finished second in the championship chase and earned the Perfit Corporation Series Rookie of the Year title as the highest finishing driver with previous sprint car experience but a first-time SOD regular. Two-time SOD champ Gregg Dalman finished third in points, Chris Jones finished fourth and Ryan Ruhl finished fifth. 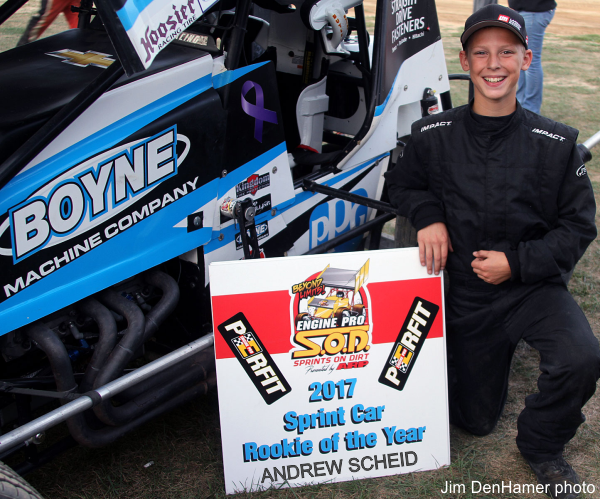 Thirteen-year-old Andrew Scheid finished eighth in the points, earning the Perfit Corporation Sprint Car Rookie of the Year title as the highest finishing driver with no previous full-size sprint car experience. Irwin’s championship has earned him a guaranteed starting spot in the COMP Cams Great Lakes Sprint Car Classic at Berlin Raceway on Saturday, September 30th that will bring the 2017 season to a close. Want to celebrate the 2017 season at the family-friendly banquet? Racers, teams, sponsors, promoters, fans, families, friends are all invited. Tickets will be $35 per person. Email director@sprintsondirt.com to order yours. Meet Engine Pro at www.enginepro.com. For more information about ARP, go to www.arp-bolts.com. Follow SOD at www.sprintsondirt.comand on Facebook at www.facebook.com/sprintsondirt. 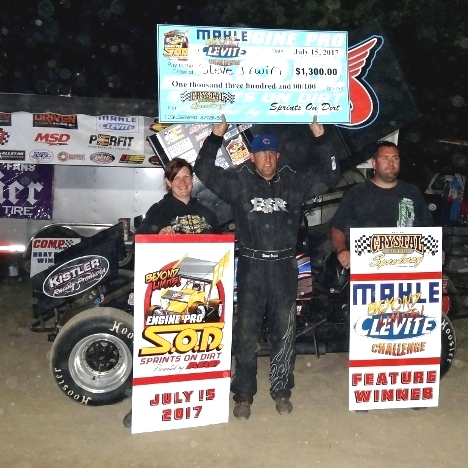 With three wins and a second, Chad Blonde (Litchfield, MI) drove Sean Robinson’s Krieger-powered Maxim to the Engine Pro Sprints On Dirt presented by ARP King Engine Bearings King of Michigan championship at Hartford Speedway Friday night. The King of Michigan, a SOD tradition as a single race before King Engine Bearings came onboard as the title sponsor, became a mini-series including all four 2017 SOD races at Hartford Speedway. The first KoM race rained out on May 19th. 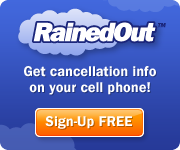 Blonde then won on June 9th and the rainout make up race on July 14th. Blonde was in victory lane for the third race also, a 5 minute and 25 second non-stop feature on August 11th. At the series closer on September 1st, Ryan Ruhl, a previous, single-race KoM winner, took the win in an exciting race over Blonde and Steve Irwin, 2001 and 2017 SOD champion. 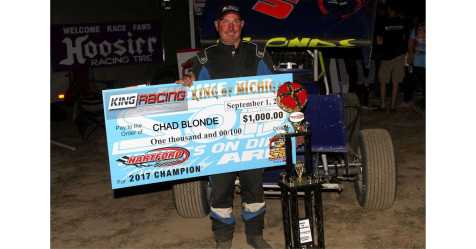 As the King Engine Bearings King of Michigan champion, Blonde collected $1,000. Irwin, Gregg Dalman (2015 SOD champion), Thomas Schinderle (2017 SOD Series Rookie of the Year), and Ruhl also earned a share of the KoM point fund. King Chad discovers that it isn’t about the money or the trophy, but about the crown. Hartford Speedway owner/promoter Tim Dibble’s monumental decision last winter to reconfigure the track to a 3/8 mile oval proved to be an overwhelming success and a big hit with fan-pleasing racing. King Engine Bearings was founded in 1960 with one simple objective: to supply the highest quality bearings available in the marketplace. By specializing in engine bearings, the King Engine Bearings team of bearing specialists has built an extensive product offering that includes a wide range of engine bearings for automobiles, light duty and heavy duty trucks, marine, aviation, standby power and many other types of internal combustion engines. Every King bearing utilizes the highest quality materials and the most advanced designs to ensure complete customer satisfaction. For more information about SOD’s King of Michigan sponsor partner, go to www.kingbearings.com. Check out Hartford Speedway at www.hartfordspeedway.net for more information. Meet Engine Pro at www.enginepro.com. For more information about ARP, go to www.arp-bolts.com. Follow SOD at www.sprintsondirt.comand on Facebook at www.facebook.com/sprintsondirt. 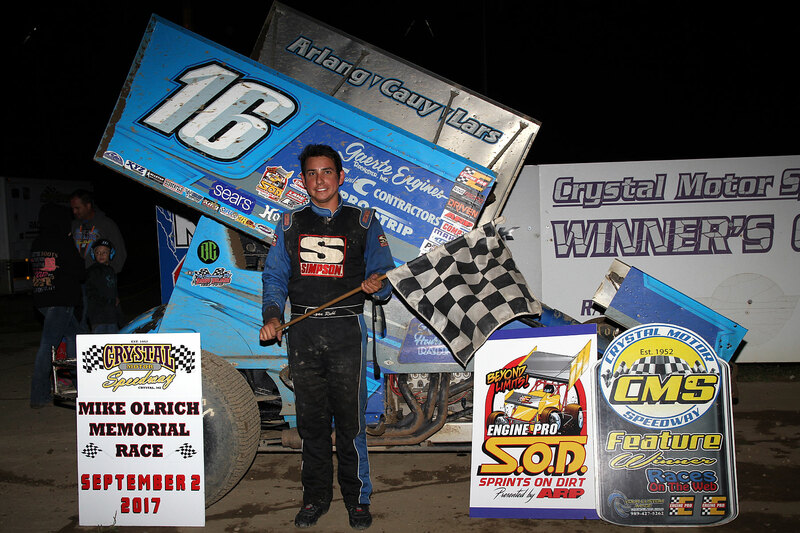 Ryan Ruhl (Coldwater, MI) capped off a great weekend by putting on a dominating performance to win his third consecutive annual Mike Olrich Memorial last night at Crystal Motor Speedway. The race was the final points race for Engine Pro Sprints On Dirt Presented by ARP 2017 season. The 25 lap SOD feature was run caution-free and in record time. 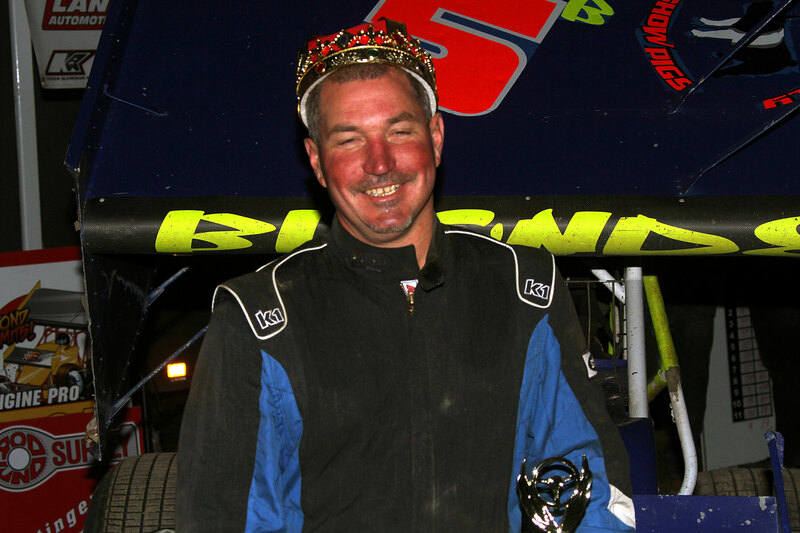 Ruhl also won the SOD King Engine Bearing King of Michigan race at Hartford Speedway Friday night. The speedway was the scene of an epic battle; there was also an impressive race too! Track owner/promoter Ron Flinn went toe-to-toe for control of the track surface with Mother Nature. Flinn, who takes pride in his track prep, was challenged after SOD heats but before the SOD feature. Determined to win out, Flinn went to work bringing back the lost race surface. Crystal’s track prep vehicles/push trucks went to work on track. All 22 SOD cars then took over and wheel packed the track. Everyone was rewarded with a lightning-fast, fan-pleasing track. Jay Steinebach and Brett Mann led the field to the green with Mann taking the initial lead. It was immediately obvious that the packed house was going to be treated to an all-out speed fest. Lapped traffic quickly made the leaders work hard, and Steinebach took advantage of a Mann check up to grab the lead. 4th starting Ruhl took the lead on lap seven though, and drove off into another time zone, expertly slicing through traffic. Steinebach faced a little pressure first from Mann, then from Dain Naida, but eventually opened up a comfortable gap. Mann got back by Naida on the last lap to claim 3rd. Steve Irwin’s 6th place finish was enough to claim the Engine Pro Sprints On Dirt Presented by ARP 2017 Championship. Thomas Schinderle finished 2nd in points and is the 2017 Perfit Sprints On Dirt Series Rookie of the Year. 2015 SOD champion Gregg Dalman finished 3rd in points. Chris Jones came back from a heat race flip to start the feature and take 4th in points over Ryan Ruhl. Andrew Scheid claimed the 2017 Perfit Sprints On Dirt Sprint Car Rookie of the Year title and finished 8th in season points.